After a day or two of minor consolidation, the broader Markets resumed its up move on Monday with a gap up opening and scaling a bit higher in the session. The benchmark Index, NIFTY50, though came off a bit from the high point of the day, ended with net gains of 60.75 points or 0.55%. Though the frontline Markets performed well, the pain remained evident in the broader Markets. 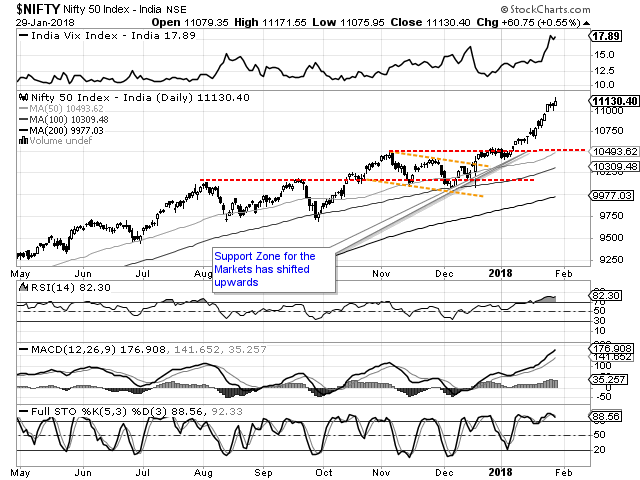 While we go into the trade on Tuesday, we expect these cracks in the broader Markets to persist for some time while the NIFTY attempts to scale higher. We continue to remain buoyant on the immediate outlook but also sound caution as gross under-performance in the broader Markets may remain for some time. The levels of 11,155 and 11,235 will continue to remain immediate resistance area for the Markets. Supports come in lower at 11,105 and 11,065 zones. The Relative Strength Index – RSI on the Daily Chart is 82.2992 and it remains in overbought territory. It also show a bearish divergence as while the NIFTY marked a fresh 14-period high, RSI did not do so. A white body emerged on Candles but it remains insignificant in the present context and structure of the Charts. The pattern analysis show that the breakout achieved by NIFTY after moving past 10490-mark remains firmly in place. There are minor signs of fatigue at higher levels and given the overbought nature of the Markets, we need to take this with some caution. Overall, there is no denial to the fact that the liquidity is chasing the momentum. 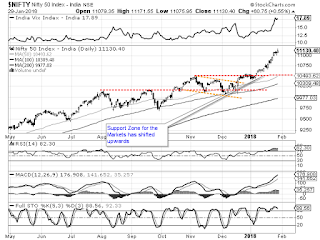 However, the important point that draws our attention is that the smart money is chasing the large caps while the broader Markets has started to consolidate and show minor internal corrective cracks. We recommend remaining extremely cautious at current levels. Though traders are left with little option but to chase the momentum, this should be done with great care remaining highly selective while picking stocks. Cautious outlook is advised for the day.